Someone wrote today and asked if I wanted to work in Angola, Africa. That brought back memories of having done that before. That was a colorful, crazy, debonair, sinfully, wretchedly beautiful experience. Here are a few journal excerpts from long ago. Luanda leaked. The city was incontinent—streetside floods and soggy lawns streamed out of broken pipelines. The city’s water supply was so unreliable that homeowners paid handfuls of pink Kwanza notes to truckers who filled their water tanks once a week. This city on the mend formed a landscape of burglar bars and humming private generators. Those who had money carried hand held radios because the local phone system was often on the fritz. From table to table at expensive cafes and chique restaurants their incessant buzz mingled with foreign accents, relaying flight data and transport requests. Before the Atlantic Ocean stretched a boulevard lined with palms. The sight of the water always gave me hope—symbolizing a big open doorway that headed out. 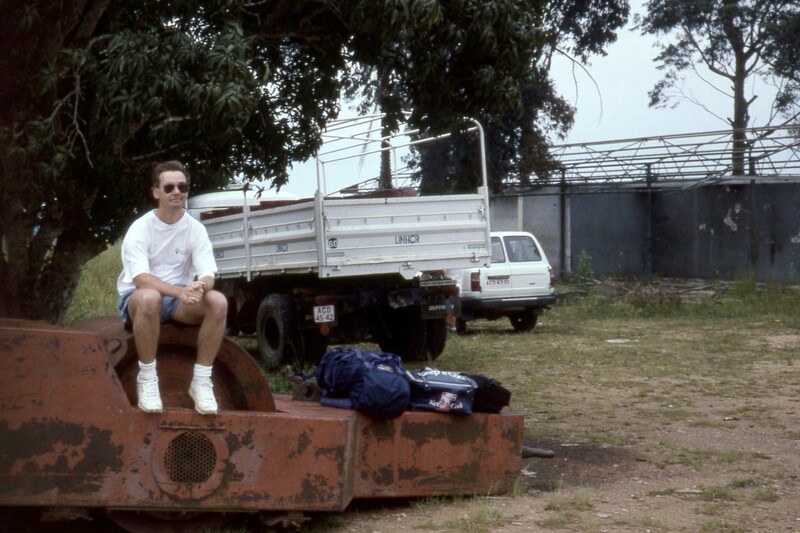 In 1995 Luanda was not pretty. It was a city of cracked windshields, open manholes and random dispersion of rotting garbage piles. Here and there walked debonair women wearing tight dresses with rich Portuguese men. They had gold fillings in their teeth and ate lobster with hot lemon sauce on the porch of the Barracuda restaurant on the Isla. Cash from diamond sales and oil revenues skewed the economy. A bunch of grapes cost $9, a bottle of water $5 and a two bedroom apartment with inadequate plumbing rent for $5000 a month. That was years ago. Many foreigners who visited Luanda wanted to stay. They learned about the best restaurants and bars and knew who threw the hottest parties. This social insight gave their lives an edge. Frustrated by a country at war they often forgot about work and gripped onto the niceties of their selected social circuit. They learned the names and faces of other Norwegians and Spaniards and became part of Luanda’s expatriate furniture. By then it was too late. They became comfortable with rich food and close friends and radio chatter from the field. Once they were in that groove and tasted the comfort of expatriate parties and loud music and big drinks and sweaty Friday evening flirtations, they realized that to visit the field would be to forgo such routine pleasures and the bliss of privacy at home. These supervisors started ladling out excuses like gravy why they had to skip traveling to the field. Rather than describe reality in their reports they wrote recycled second hand garbage pulled from radio conversations and included graphs and statistics extracted from old U.N. brochures. 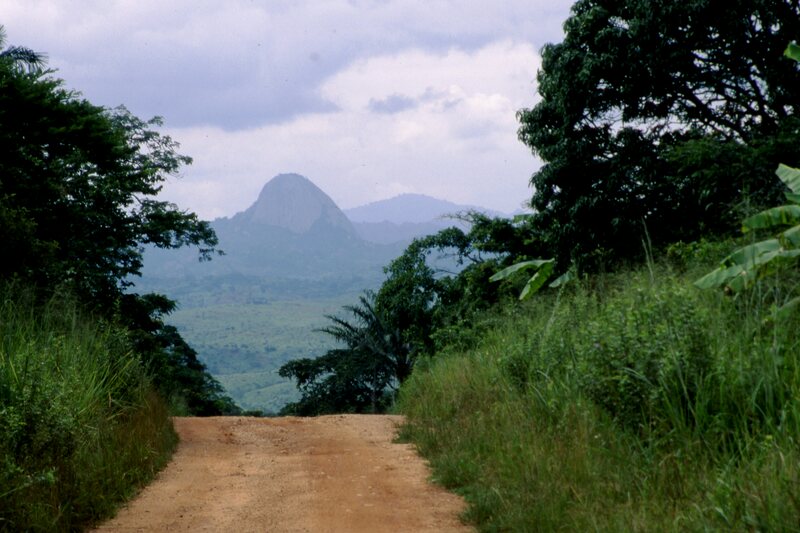 These supervisors who wallowed in expatriate delights eventually skipped all travel to rural Angola. After all, who wanted to step into a muddy war zone? And yet, that is the reason they came in the first place. This rift formed the divergence between field workers and those who yawned and counted hours in offices in Luanda. 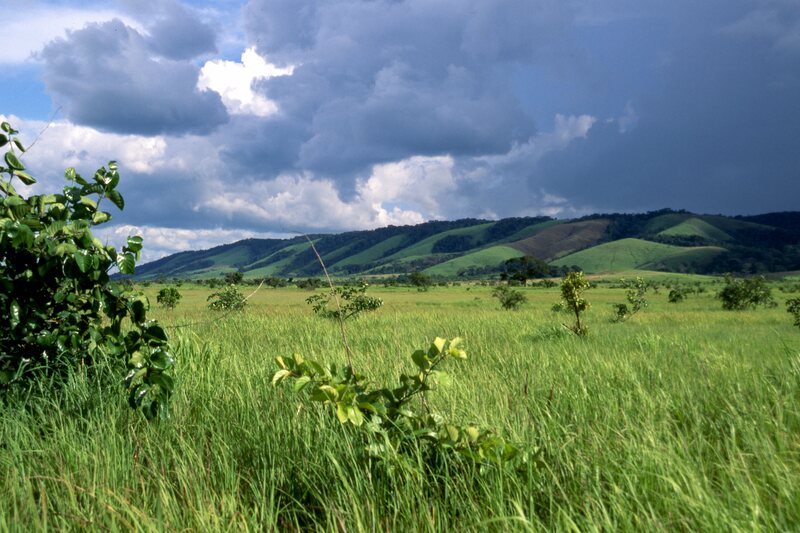 It often grew huge—like a separation of the island of Madagascar from continental Africa. As differences wedged wider apart, workers in the city and those in the field found their goals, attitudes, methods and relationships differed so as to be practically alienated from one another. Eventually the only thing shared by those in the field and those in the city became a Luanda bank account and a few boxes of letterheads. When this happened to you—if you had your wits about you—you knew it was time to leave Luanda. You had to get into the countryside or out of the country. Otherwise you turned soft, self centered and, eventually, cynical. But if you were switched on and realized how removed from reality you had become, you would get a plane ticket and get out. 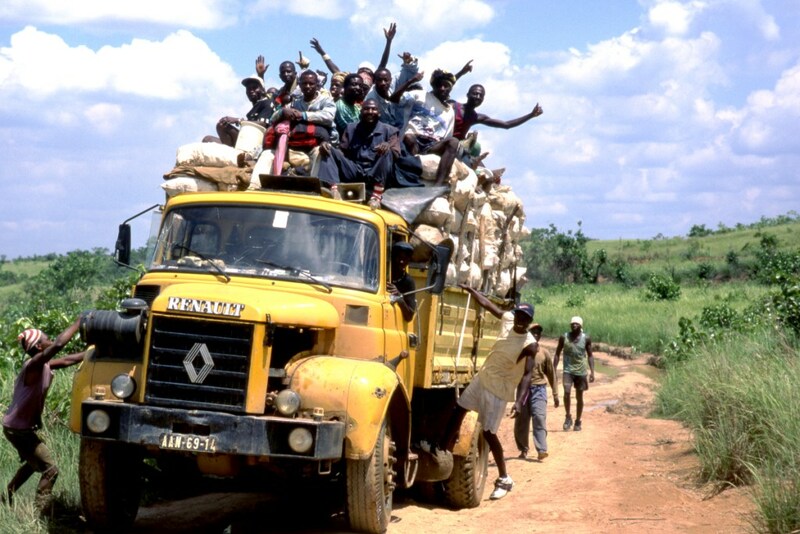 In October of 1995 I traveled to Angola to work with the International Medical Corps. When I arrived in the capital city of Luanda, one U.S. dollar was equivalent to 10 million Angolan Kwanzas in the local currency. Because the government printed 10,000 and 100,000 Kwanza notes, you had to carry a cardboard box filled with bundles of notes wrapped in rubber bands just to buy groceries. Wallets were obsolete. When I caught a small plane that flew from the capital city to our work site—a town named Maquela Do Zombo—our team tried carrying the equivalent of U.S. $100 with us. The cardboard box filled with Kwanza notes was so heavy that the pilot weighed it on the runway by placing it on a bathroom scale. When he considered all our luggage, his verdict was clear. We had to repack the box, leaving bundles of cash behind us for the Luanda staff to take back to the office. We managed to bring the equivalent of $20 along. After we arrived in the town of Maquela do Zombo in the northern province of Uige, I bought fourteen ‘penny nails’ for 7 million Kwanzas at a local market. It took five minutes to count seventy notes by hand. The vendor then rejected half of the bills, complaining they were torn. We next drove to ‘Ton-Ton” the local bottle store. There we sat outside and drank liters of Skol lager. On Friday afternoon a bottle of beer cost 12 million Kwanzas. By Sunday morning the cost was 14 million Kwanzas. By early afternoon the price jumped to 15 million Kwanzas. Lest the cost hiked up while we drank, we had to agree on the price of a liter before ordering it. The government then issued a new currency. They lopped three zeros off the Kwanza value, creating the Kwanza Readjustado. One handsome pink notes (showing a hammer, sickle, red star and an offshore oil platform) was 10,000 KR—the equivalent of a dollar. Ah, life suddenly turned easy again! I could use my wallet. Machines that counted bills stopped fluttering throughout Angolan stores. Outside Luanda our team (mostly doctors and nurses) worked ‘behind the lines’ in rebel held territory. 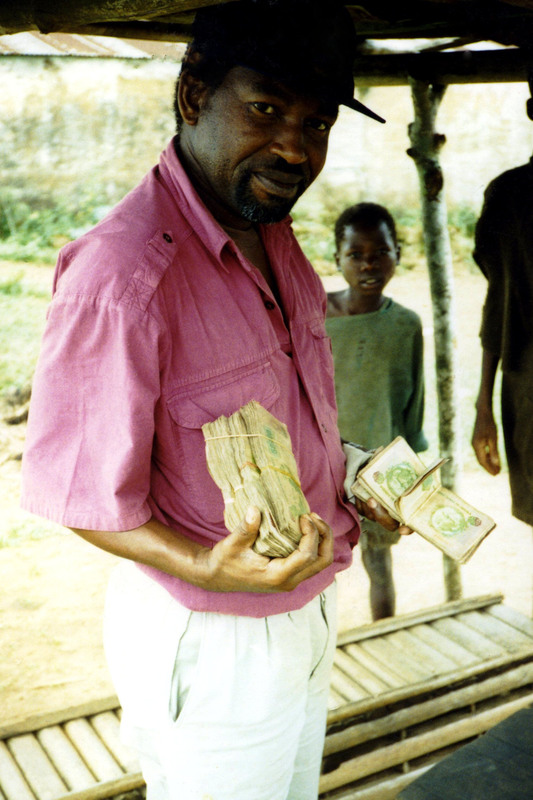 For weeks after it was printed, the rebel government of Jonas Savimbi did not accept the new money. When they finally did, the old Kwanzas were declared worthless overnight. No matter how many boxes of bills a family might have stashed as their savings, they could not exchange the bills for new notes. Rampant inflation kept soaring. After a month, the Kwanza Readjustado was worth only fifty cents and a month later it was 25 cents. When I left Angola months later, it took five notes to buy one U.S. dollar. Wallets grew fatter as inflation grew. Banks ran out of new notes and started recycling old Kwanza bills. Their counters lay stacked with towers of old notes. The economy was bizarre in this war impacted country. 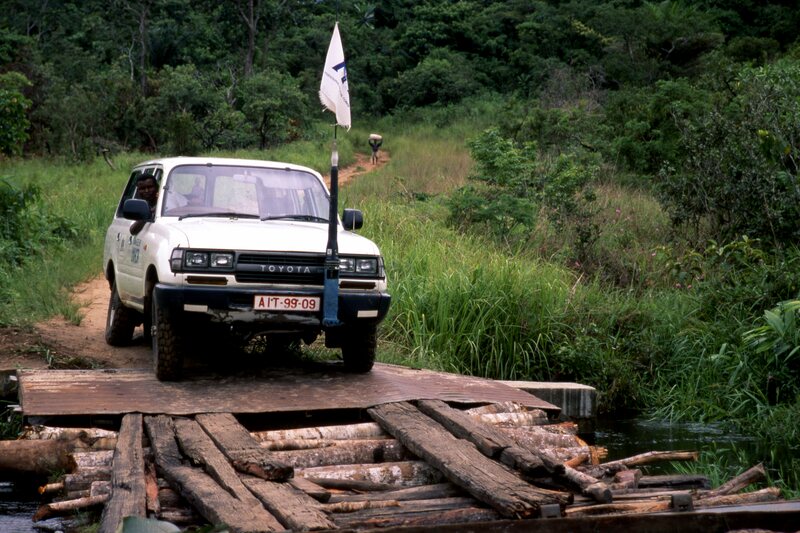 Money was generated by UNITA rebels selling diamonds and the FRELIMO government selling oil. Women wore fashionable dresses and ran around dialing cell phones, moving between bustling restaurants that accepted both Kwanzas and dollars. Travel agents refused to accept credit cards, yet when I offered to pay $388 by personal U.S. check to fly round trip from Luanda to Harare, Zimbabwe, they agreed without question. The country’s strange economy was also ridiculous. During the peace process a team of International Monetary Fund specialists visited the nation. Weeks later they threw up their hands, declared themselves baffled by the lack of bookkeeping, and flew off, clueless as to how the government accounted for its cash. 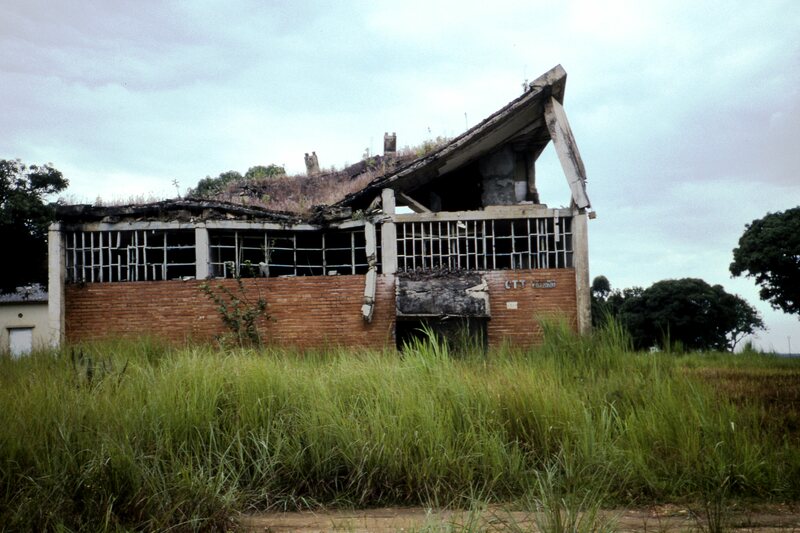 That didn’t matter where we worked in rural Maquela Do Zombo. We carried money to the local market in cardboard boxes, then doled out stacks to buy rice and razors. If we ran out of cash during a drinking binge, Ton-Ton’s wife extended credit without fail. We had food and beer and friends. A group of bored United Nations Peacekeepers once built a volleyball net from mosquito netting in our back yard. What more did we need? Life was simple. Racehorse inflation was simply part of it. When I look back at those brief months in Angola, it all seems to have been a ludicrous dream, an Alice in Wonderland chapter turned real. Yet for many, this was their daily reality. If I hear in the U.S. how the price of a sirloin steak tripled in two decades while salaries only doubled, I’m hardly worried. We are living in some very good days. Our porch lanterns threw scant light onto the streets of Maquela Do Zombo. Five of us sat at an outdoor porch table near the kitchen: myself, a tall Swede, a serious Dutchman, a drunk French logistician and a debonair nurse from Spain’s Catalonia province. We finished eating a plate of cheese and sliced apples (flown from the city of Luanda that afternoon) and cleared sticky beer glasses away to the dark kitchen. Our flutter of movement cut the silence like bat wings. A cool wind rubbed our backs and we stepped into a vehicle. We drove like intruders through the empty main street, searching for cold beer. Little else moved that Saturday night in Maquela Do Zombo. Our favorite bottle store Ton-Ton was closed, as were three other bars in town. The Swede drove down the twisted trail of a muddy hill and braked outside the nearest bottle store—a dirty brick room named Kola-Kola. Xavier lit a cigarette. He wobbled over and leaned against a porch column. He was a brash, egotistical and drunk Frenchman in his late 20’s. “Why is everything so quiet?” I asked. The bottle store owner woke. She stepped out of her dark home into the cool, wan light. She vanished, then returned lugging a crate of eight liter bottles. Xavier and I paid her in pink 10,000 Kwanza bills. We counted out twenty four between us. We then thanked the woman and drove back to the sanctity of our porch table. Xavier had arrived at our building earlier that evening, drunk, giggling and reeking of tobacco smoke. He came to tell the Catalonian nurse Magda to return to their Medicenes Sans Frontieres house where she lived up the road. She refused. She had also refused earlier in the evening, when Xavier sent a car and driver to find her at 9:00 pm. Jacques did not like Xavier. Jacques was a crew-cut Dutch policeman who worked with the United Nations UNAVEM group. His shirt was pressed and his handshake was firm. While Xavier sat with us and flopped around in his chair like a minnow in a teacup, Jacques drank tonic water and watched him. Waiting for the Hercules cargo plane to fly out…. After Xavier left to the Medicines San Frontieres home and office—their pink castle on the hill—Jacques spoke. Magda was bright and playful, a Catalonian with curly hair, colorful t-shirts and white tennis shoes. She was 34 years old. Unlike others in her organization, she never hesitated to venture away from their pink castle for a spontaneous social visit. But then, she was different. Whenever we invited the Medicines Sans Frontier team to our house for dinner, they arrived as a group. When, in turn, we visited them, they presented plates of French chocolates and aperitifs on the porch table before us. Our gatherings were warm and cordial. Yet they considered it taboo for team members to make forays away from their lair. After months of virtual social imprisonment due to these ridiculous security rules imposed on employees, Magda broke the protocol by coming to visit us. And what happened? Within hours Xavier chased her down, then insisted that she return to their base. The local post office. Some MIG plane bombed it back in the day. “Don’t like him,” Jacques repeated. “He’s strange,” agreed Matts, a tall UNAVEM police officer from Denmark. I just put away glasses and cleared the table. The night watchman, an Angolan, sauntered over to our table and whispered. He looked frightened. He described in Portuguese how two men had just walked by the front porch and pointed rifles at him—commanding him to urge our group to stay quiet. On hearing this I wondered what to do. Should we follow their admonition and snuff out our glowing little party on a quiet Saturday night? I told the watchman not to worry. I decided that if the men returned, we would invite them to come visit the governor with us the next day. That would certainly frighten them. Above all, these men heeded power; they cringed before authority. That was how Magda differed from most others in town. Unlike those in her organization and unlike the Angolan men in this dark town, Magda did as she desired. She ignored rules and followed her spirit and intuition. That was why life drew this woman to Angola. Such a rich, unusual time in life. Ma che bell’articolo quello sull’Angola. Bravo. 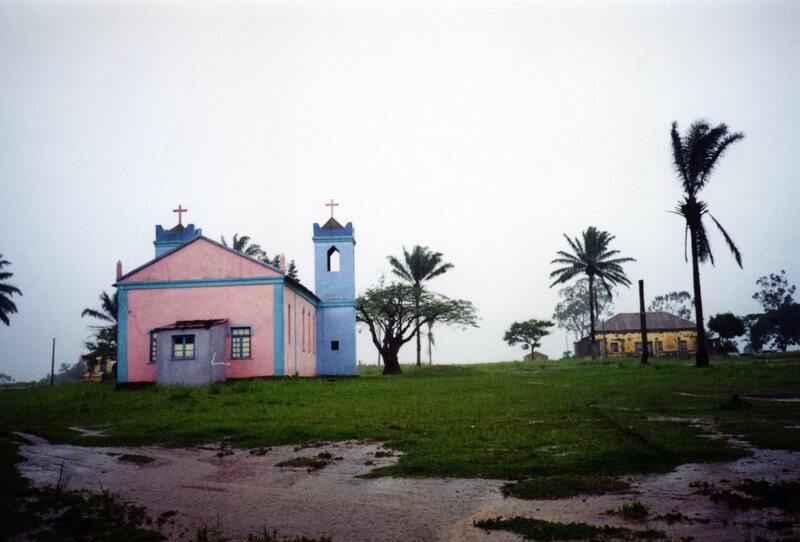 Which means – But what a nice article about angola. Nice one.